My contractor brother used to say to me, “Louie, you’ve got it made – teaching is easy!” He was wrong! Similarly, jurying an enticing exhibit of ceramics from a large pool of creative work is not an easy assignment! The pieces that were entered in the bi-annual Red Lodge ceramic show were submitted via jpegs. over the Internet. So, I looked at the work in two-dimensions on my computer monitor – which is not the most ideal. I’m not sure of the exact number of entries; suffice it to say it was a lot! The hosts of the clay show asked me to select 40 pieces to fit in their gallery space. In the end, I selected close to that number. If I could have accepted more, I would have! Several artists who submitted work should have had all three of their pieces accepted, but instead, I opted to limit one piece per accepted artist. I quite simply wanted to get more artists into the show. Also, there were several artists in my “maybe” category that could easily have been accepted had there been a larger venue. There was a nice range/variety of clay work to select from. 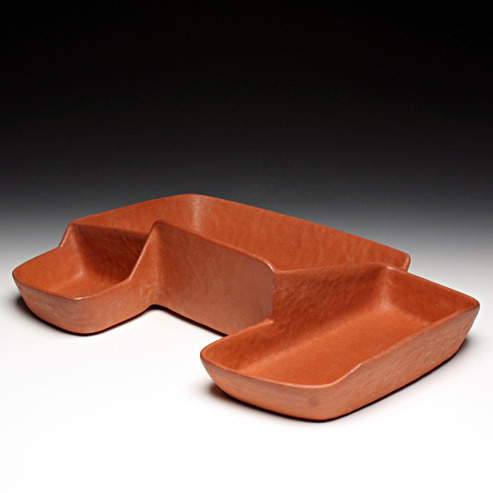 Observers of the show (either in person or via the Red Lodge Clay Center website) will note that more than half of the show – perhaps three-quarters – is pots. Not unexpected from someone who has been involved with the vessel form ever since I started in clay back in 1963. Congratulations to those artists whose work was accepted. For those who were not successful in “getting-in,” I hope you are not too disappointed. After all, it’s just one person’s decision. Another juror would have selected an entirely different exhibition.